One of latest projects at Fine Framers has seen us help preserve some wonderful memories of a wonderful trip for a well-known local family here in Carlow. Our client international rugby star Sean O’Brien’s sister Carloline. The trip was to New Zealand this year for the memorable British & Irish Lions Tour. Once Sean was selected for the Lions squad, several members of his family arranged to go see him play there – and Caroline and her family were among them. They saw Sean play in all three test matches against the All Blacks, which included seeing him round off a brilliant move for a great try in the first of those. But the trip was about much more than rugby too, as the whole family had many great experiences together. Caroline came to us with a photograph she particularly liked. It was a silhouette of her two young sons wading in the still waters of one of New Zealand’s great beaches. 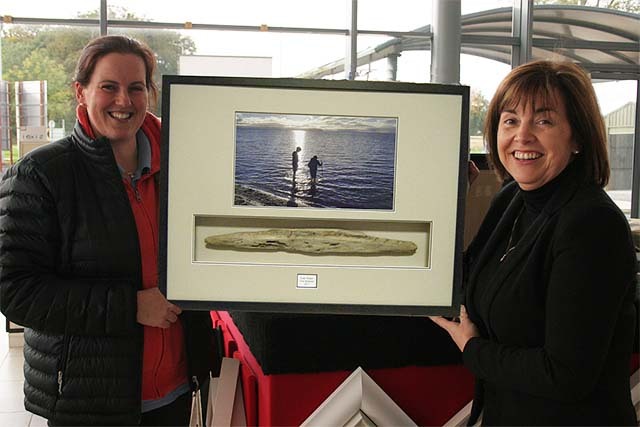 She also brought us a piece of driftwood her sons took from there, and wondered if we could combine both in a framed display. We said no problem, as jobs like that are exactly what our 3D object framing service is for! We chose a cream mountboard and deep-set frame, to accommodate the piece of wood. It is sealed in such a way that it will not deteriorate over time, and it perfectly sets off the picture above. Also included in the display is a small plaque, giving the location and time of the occasion. Caroline was delighted with the result, as you can see from her broad smile as she collected the display from our team member Ella. This project again shows how we can frame just about anything, for family memories or anything else. If you would like special items and pictures framed too, just contact us or call in to see us. You’ll find us at the Wexford Road Business Park, on the outskirts of Carlow.